Lee Stetson has been a veteran to college admissions for over 29 years. As Dean of Admissions at the University of Pennsylvania since 1978 he has witnessed the ever changing landscape of college admissions. Lee received a Bachelor of Science degree in business administration and economics from the University of Delaware in 1963. Upon graduation, Lee completed a management development program with Bell Telephone Company. He then served in South Vietnam as an officer in the Signal Corps in the United States Army. In 1966 he began teaching at Springfield High School in Pennsylvania and moved on to higher education at the University of Delaware as an admissions officer. 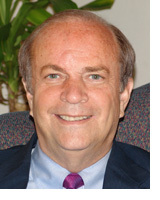 After becoming associate director of admissions, and finally the director of admissions, he completed his career at the University of Delaware in 1978. During this time, he completed his master’s of science degree in psychological services with an emphasis in counseling and administration at the University of Pennsylvania. Active in the Philadelphia community and many academic circles, he has served on the Board of Trustees for the College Entrance Examination Board and on the Board of Directors of the Custodial Trust Company. He has also served as a past President of the Potomac/Chesapeake chapter of the National Association for College Admission Counseling. For the last 28 years, Lee has been the Dean of Admissions at Penn where he is responsible for the administration of the Office of Undergraduate Admissions, including over 20 admissions officers and 30 support staff. In addition to consulting with many national and international organizations and universities, Lee travels extensively speaking to alumni, counselors, parents, and of course, anxious high school students. The office recruitment efforts have resulted in an increase from 7,000 applications per year when his tenure began, to nearly 23,000 applications today.